A 3-day-old boy neonate referred to the hospital because of indirect hyperbilirubinemia, which was treated with phototherapy. His complete blood count showed the following: Red blood cell, 5.89 × 10 12 L, Hb, 16.7 g/L; hematocrit, 0.49.91 L/L; mean corpuscular volume, 86.3 fL; mean corpuscular hemoglobin (MCH), 25.9 pg; MCH concentration, 303 g/L; red cell distribution width, 20.8%; platelet, 540 × 10 9 /L; mean platelet volume, 9.1 fL. white blood cell (WBC), 11.55 × 10 9 ; A differential WBC count revealed the following: Neutrophils, 27%, lymphocytes 64%, monocytes 6%, eosinophils 2%, atypical lymphocytes 2%. Both baby and mother have A positive blood group, and direct antiglobulin test was negative. Total bilirubin 25 mg/dl and indirect bilirubin 24 mg/dl. 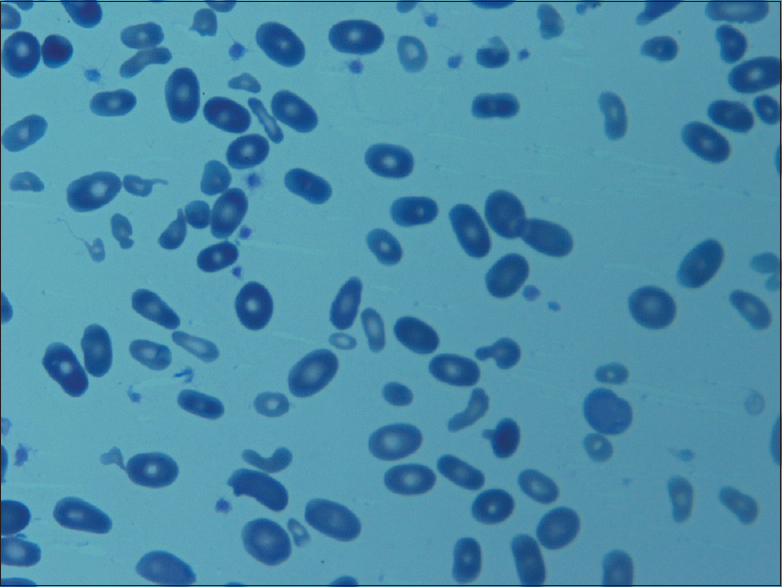 A morphology assessment of his blood sample peripheral blood with leishman stain [Figure 1] shows marked aniso-poikilocytosis, microcytosis, hypochromia, elliptocytes, and fragmented red cells indicating the diagnosis of hereditary pyropoikilocytosis. Membrane disorders are characterized by defective horizontal interactions between membrane proteins. ,, The differential diagnosis is Hereditary elliptocytosis in the severe form. The patients of such condition need to be followed also for a possible need for red transfusions in the first few years of life. Ogburn PL Jr, Ramin KD, Danilenko-Dixon D, Fairbanks VF, Ramsey PS. In utero erythrocyte transfusion for fetal xerocytosis associated with severe anemia and non-immune hydrops fetalis. Am J Obstet Gynecol 2001;185:238-9.
del Giudice EM, Perrotta S, Nobili B, Specchia C, d'Urzo G, Iolascon A. Coinheritance of Gilbert syndrome increases the risk for developing gallstones in patients with hereditary spherocytosis. Blood 1999;94:2259-62. Delhommeau F, Cynober T, Schischmanoff PO, Rohrlich P, Delaunay J, Mohandas N, et al. Natural history of hereditary spherocytosis during the first year of life. Blood 2000;95:393-7.